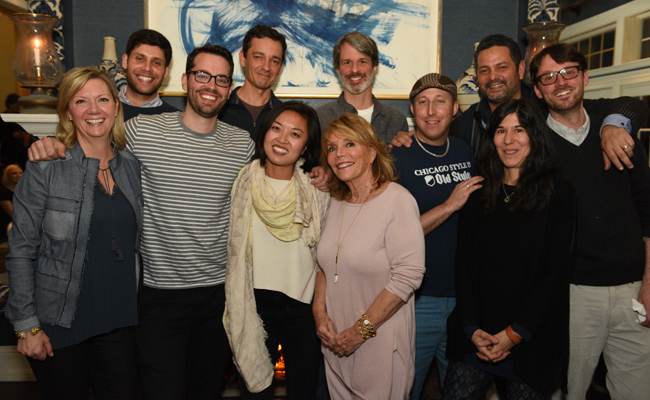 Screenwriters and mentors arrived Friday night at c/o The Maidstone in East Hampton, diving right into a collaborative weekend of insight, inspiration and hard work at the 2016 HIFF Screenwriters Lab, supported for the first year by the Melissa Mathison Fund. After settling in with a group dinner on Friday night, the group spent much of Saturday in mentor sessions. Even though the weather did not fully cooperate, throughout the weekend the writers and mentors took advantage of the spectacular location. Mentor sessions took place at the beach, on nature walks and in local coffee shops. 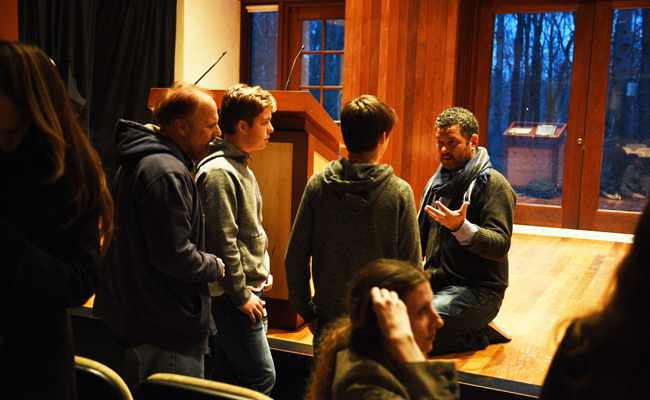 Saturday afternoon the group headed to the Ross School for a Master Class from Oscar® winner (and 2015 Mentor) Alexander Dinelaris (BIRDMAN). Open to the public, the Master Class drew a terrific turnout from the local community, including many young writers as well as film lovers. Alex stayed afterward to answer questions from aspiring screenwriters and directors. Saturday evening mentors and screenwriters were joined by Hamptons locals and Lab alumni for a lovely dinner, generously hosted by our board members. At the party, Alex reunited with two of last year’s lab writer participants and continued what has now become a year-long mentorship with them. The final mentor session on Sunday morning was followed by an extended group session on Sunday afternoon—a new addition to the Lab—where each writer had the floor to discuss any last-minute thoughts and any conflicting ideas in the suggestions offered by the mentors. Debates about key characters continued, with the whole group offering up questions and suggestions, elaborating on what worked best for key elements of each script, etc. The discussion was a rewarding and wonderful way to wrap up the weekend. What’s next? We are now selecting donations for the Melissa Mathison Fund. As the inaugural recipient of fund support, screenwriter Cathy Yan’s DEAD PIGS will have a staged selected scene reading at the Festival this fall. Stay tuned! Thanks to all who participated, hosted and contributed to this fabulous weekend. Group shot of mentors, screenwriters and HIFF staff at the 2016 HIFF Screenwriters Lab Master Class in East Hampton, NY. Marshall Curry (writer) talking with Michael H. Weber (mentor) at the 2016 HIFF Screenwriters Lab Master Class in East Hampton, NY.